Print this guide to find the right size for you. Sangria band fastens with a peg and loop. Black, Lilac and White classic bands fasten with a buckle and tang. 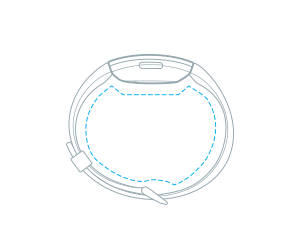 The Fitbit Inspire™ and Inspire HR classic band is made of a flexible, durable elastomer material similar to that used in many sport watches and includes an aluminum buckle. The sangria band closes with a simple peg and loop. Fitbit Inspire™ and Inspire HR™ are swimproof, meaning they&apos;re water resistant to 50 meters. After swimming or getting the band wet, we recommend drying off the band because, as with any wearable device, it&apos;s best for your skin if the band is clean and dry. We do not recommend wearing Fitbit Inspire™ or Inspire HR™ in a hot tub or sauna. See www.fitbit.com/productcare for more details. 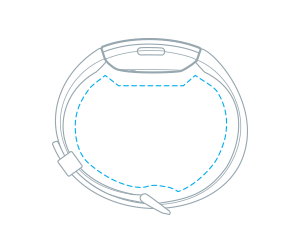 If the Fitbit Inspire™ or Inspire HR™ classic band gets wet or if you sweat in it, remove and completely dry the band before putting it back on. Give your wrist a rest by taking the band off every now and then. Learn more.